Chinese for Beginners is an excellent, user-friendly book for learning the Chinese language. Yi Ren has taught thousands of Americans to speak Chinese fluently. Now, she and co-author Xiayuan Liang share their secrets for fast mastery of Mandarin Chinese with you. China has 1.3 billion people, and due to initiatives to phase out regional dialects in favor of Mandarin Chinese, nearly all of them can communicate in Mandarin. Don't let yourself be intimidated by this rewarding language. Although it is true that mastery of the Chinese language takes time, Mandarin Chinese has simpler grammar than English, and there are no conjugations--meaning anyone can learn a few critical phrases in no time. Chock full of extra hints and tips from the authors' many years of experience teaching Mandarin Chinese in adult evening classes, Chinese for Beginners focuses on realistic situations you'll encounter when you meet people in China. New words are explained concerning how you'll use them to communicate with new friends. 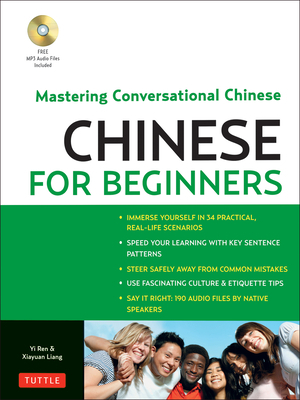 The audio-CD is another excellent way to learn Chinese and lets you listen and repeat and remember the sentences with ease, and will help you soon declare with pride, "I can say that in Chinese "
Real-life dialogues and situations to help you converse with confidence. An "Extend Your Vocabulary" feature in each chapter helps you to remember and understand more words that you'd think possible. Answer Keys help you keep track of your learning process. Interesting notes, idioms, sayings, photos, poems, and insider tips about China's culture, unique places, and everyday life add to the adventure. This user-friendly guide to learning the basics will work for anyone who wants to speak and understand Chinese for business, for pleasure, or for travel--and who wants to enjoy the process of learning a new language while they're at it. Yi Ren taught and researched in Beijing after graduating from Tsinghua University. On moving to the U.S., she began to teach Chinese to children at weekend Chinese Schools, and also to tutor others in Chinese. After years of being worn down by her adult students' begging her to do it, Yi decided to capture her special teaching methods on paper, in a book to help other adult Chinese learners. She lives with her family in Denver, Colorado. Xiayuan Liang practiced medicine in China before coming to the United States in 1986. She did biomedical research at Washington University in St. Louis and Georgetown University, then resumed her career as a physician. She currently is an associate professor at University of Colorado School of Medicine. In her spare time, Xiayuan likes to read and to discuss interesting topics with friends--in Chinese, of course!